Mindika Moments: How do you bribe an Elder? How do you bribe an Elder? Melinda, this post is just for you! When I served my LDS mission in South Carolina, I had a very wise trainer who taught me an important lesson...sometimes you have to bribe the elders to get what you need...and these peanut butter bars always did the trick. In fact the elders loved them so much that later in my mission my entire district of Elders kidnapped my gold fish and held it ransom for these cookies. Yes Stacy...one of them was your husband! You'll have to make these cookies and ask him about my poor little Sellwood. 1. Preheat oven to 350 degrees and prepare a 9x13 pan by spraying it with nonstick cooking spray. 2. Cream sugar, butter, and eggs until well blended. 3. Add vanilla peanut butter, mix well. 4. Stir in dry ingredients, including oats. 5. Spread into the prepared 9x13 pan and bake for 20 minutes. Mix powdered sugar, coco and butter in a mixer. Add vanilla an milk, mix until creamy. 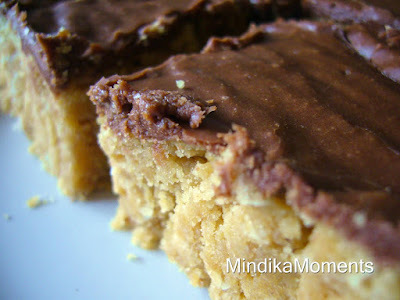 Oh my gosh those peanut butter bars look so good, I'm drooling on my keyboard. How do you do it all? I think you are amazing! I love peanut butter and chocolate together! They look so good. This is just like cade's favorite peanut butter bars. They are so yummy! Oh what fun memories! And remember how we found a street that was named Norwood, we took our picture by it. I still love those peanut butter bars, can't make them too often or I eat too many of them.